As an attentive fan of architecture, one of Two Who Trek especially enjoys the visual study of Spanish colonial architecture. During our nearly month-long stay, we visited many sites with our local Spanish instructors or profesores. In and around El Centro Histórico de Cartagena de Indias are many splendid buildings or edificios, both grand and typical. A short taxi ride east of El Centro is the largest Spanish fort in the New World, El Castillo de San Felipe. Construction began in 1639. It took more than a century to complete. La Popa is a 500 foot (150 meter) hill east of El Castillo. It resembles the stern of a ship and is so named for the Spanish word for the stern, la popa. The area atop La Popa was reportedly a former pagan worship site and is now home to Convento Nuestra Señora de la Candelaria. The monastery, built by Augustinian monks, honors the Virgen de la Candelaria. This venerated Lady of Candelaria relates to a statute of the Virgin Mary found by a goat herder in the Canary Islands. The woman in the statue held a baby in one arm and a green candle in the other. La Popa, high above the city. This shot was taken from Bocagrande. Just outside El Centro is the Museo Rafael Núñez. 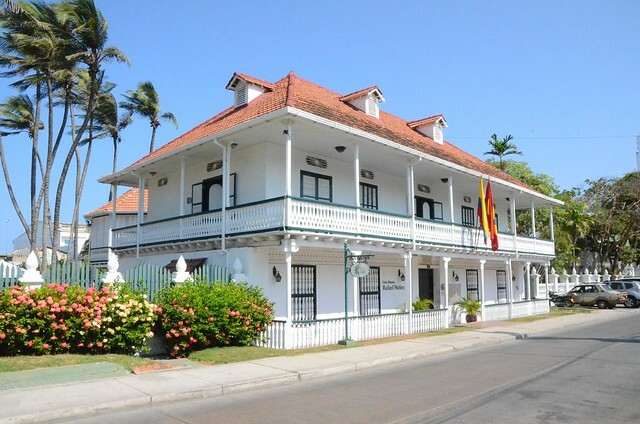 The museum is housed in the home formerly owned by the 19th Century Colombian President Núñez’ second wife, Soledad. The home and furnishings are very well maintained. Núñez was born and died in Cartagena. He was President four times and wrote the 11-verse national anthem. He also authored the 1886 Colombian Constitution which remained in effect for over 100 years. Wandering outside the old city walls was well worth the trip! No visit to Cartagena would be complete without seeing the massive city walls that surround the city. The historic center is surrounded by about 6.8 miles (11 kilometers) of thick defensive walls that were designed to prevent pirate and military attacks on the city. Combined with the El Castillo de San Felipe, Cartagena became a militarily impregnable city. Construction on the walls began in 1586, with additional walls added at other times. Some portions of the wall were removed in the past for urban expansion, but the remaining walls are well preserved. Today the walls are very accessible, with stairways and even ramps to the top. The local residents enjoy spending enjoy spending time in and on the walls. Here are a few images of the walls that remain around the city. We toured El Centro proper on foot, by taxi and by horse-drawn carriage. It has been two years since we enjoyed our Cartagena adventure. The fond memories of the people and places are now part of us. We humbly offer an original poem by one of Two Who Trek, in Spanish, called “Scenes from Cartagena”.